Changing up the color scheme in your kitchen is a relatively low-cost way to breathe new life in the heart of your home. But with a sea of color options to choose from, finding the perfect shade can be a daunting task. To narrow your options, the design experts at HGTV.com suggest honing in on a hue that will reflect the mood you want the space to convey. White, gray, blue, red, yellow, and green are good choices for kitchens, the experts say. “Each of these shades can do something different for the room, but they all help create a warm and welcoming space,” HGTV says on its website. 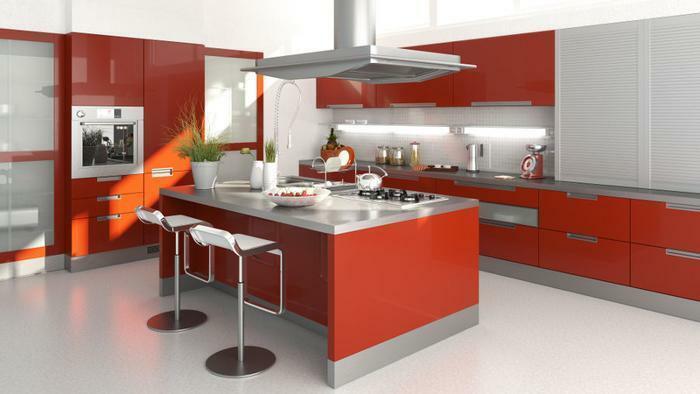 For a kitchen that will get your loved ones in the mood to eat, consider choosing a color from the red family. Reddish oranges such as cabernet, persimmon, or brick add vibrancy and warmth, say the experts at Better Homes & Gardens. The shade works especially well when presented in large sweeps, such as on cabinets or islands. White continues to be a popular color palette in kitchens for its clean, fresh, and energizing look. “An all-white kitchen will really wake you up the minute you step in it. You can also have more fun with your countertops and backsplash in an all-white kitchen and choose brighter colors or designs for those,” says HGTV. Crisp white can be decorated around in an endless number of ways. Make it modern by pairing it with stainless-steel accents and clean lines or give your kitchen a cottage feel by incorporating beadboard and white cabinets. Painting walls and cabinets isn’t all home decorators can do to bring color into their kitchen. These days, appliances can also complement the color scheme of a kitchen. KitchenAid recently expanded its line of appliance offerings to include four new stoves in different colors: signature red, cobalt blue, imperial (matte) black, and imperial (matte) white. "These new models give those who design with color in mind a way to combine commercial-style performance with a fresh, new look,” KitchenAid said in a statement. With a pricetag in the $5,000 to $10,000 range, the commercial-style ranges may not be practical for everyone. But as more home decorators seek to round out their kitchen color palettes with appliances in complementary tones, colorful appliances could soon become more prevalent among manufacturers.